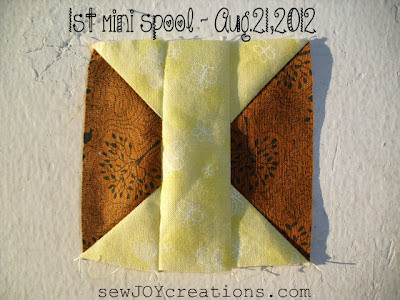 Sew Joy: New Leader and Ender Project - Mini Spools! 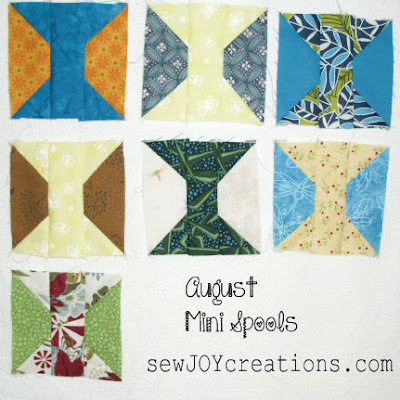 New Leader and Ender Project - Mini Spools! Bonnie Hunter got me again! 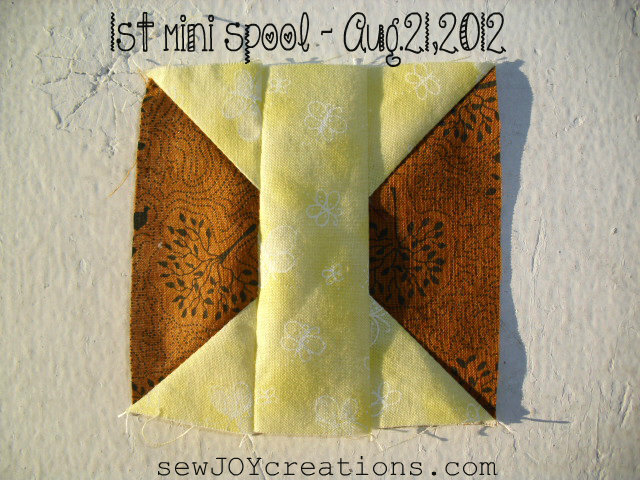 I passed on the mini bowtie blocks, but couldn't resist the mini spools challenge. Here's the direct link to her start up post. The blocks are 3 1/2 inches unfinished. Luckily I had a whole bunch of 1 1/2 inch strips leftover from making my mini log cabin blocks. This photo shows some spool fabrics prepped and ready to go. It is a leader and ender project, which means it's not a quick finish. With the blocks being 3 1/2 inches big I figure it's not a quick finish no matter which way you make them! 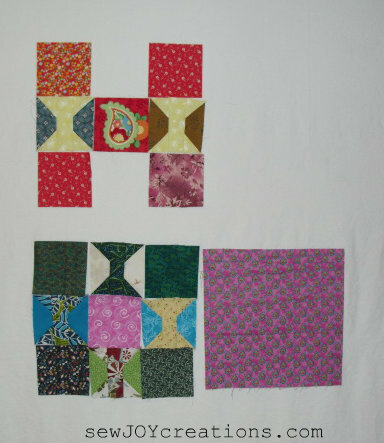 But, I do have a whole bunch of 3 1/2 inch squares cut for another scrap quilt that I haven't started and have somewhat fallen out of love with. I could use the squares to make 9 1/2 inch unfinished blocks with the mini spool blocks. 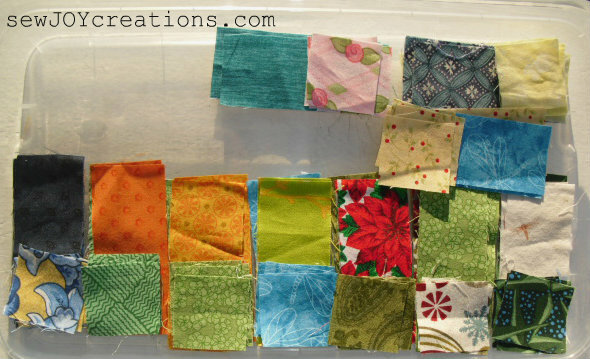 To keep going with the use-up-your-stash theme, I could also cut 9 1/2 inch fabric squares from my stash and get a quilt top made even faster. 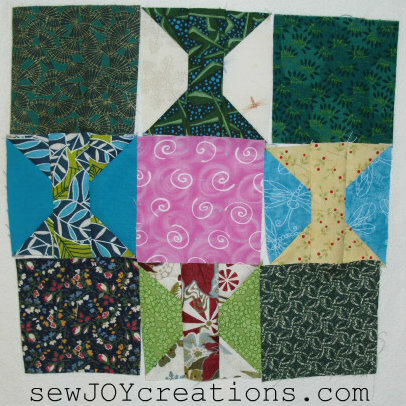 I could do the double 9 patch look with 5 spool/square blocks and 4 stash squares per 27 1/2 inch block. That's a lot of stash used up! For now I'm just happy to have started another leader and ender project. These little blocks make me happy! I'm going to try and post a monthly tally shot to keep my mojo going on this one. Because a little part of me would really like to make a giant medallion quilt with a big set of mini spools all lined up in the center. Do you have a leader and ender project in the works? I did the bowties and made a cute little quilt. I am so far resisting the spools. I am doing some great granny squares and using them as my leaders and enders while I work on my Farmers wife quilt blocks.